It's championed by some as a new weapon to defend content-makers, decried by others as a blunt tool that could extend censorship of the net. One thing's for sure - Russia's new anti-piracy law is proving controversial. "Access to online content should be free and global, because it is people's right to freely receive and distribute information, as well as it is their right to consume art," says Natalia Malysheva, of the Russian Pirate Party. On Sunday, the party held a protest in central Moscow against the law, now active, which allows sites to be blocked if they do not tackle complaints that they are aiding copyright infringement within three days of being notified. About 300 people, waving black pirate flags, attended the peaceful event. "We respect the rights of those who produce films, music and books, but the rights of copyright holders should be secondary after the rights of society," said Ms Malysheva. 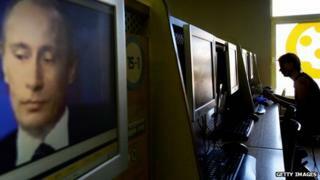 Online piracy is rampant in Russia. In local internet cafes and at home, teenagers log onto VKontakte, Russia's equivalent of Facebook, to copy and share music and videos despite the company's protestation that it removes files if it receives "legitimate complaints from copyright holders". As he comes home after a long day in the office, 41-year old Pavel tells the BBC that his favourite way to relax in the evening is to watch an action movie on his computer - and any film, he says, is just a click away. He says that he doesn't support piracy but has no time to go and buy a DVD. Russia's legal online film services have either "ridiculously high prices per movie or very limited selection - or both", he says. "I am willing to pay money to find good films easily and quickly, but at the moment in Russia it's just not possible." Russia is high up on the US's list of the world's worst copyright infringers. In May Washington raised concern that Russian police resources devoted to the problem had "sharply declined over the past two years". However, it added that it was "encouraged" by the new legislative efforts to combat the problem - something both it and American media companies had long lobbied for. The new law promises to protect movie and television rights holders facing online piracy by targeting websites that facilitate access to pirated video content. Communications regulator Roskomnadzor will be responsible for making sure it is enforced. "The law will help develop legal video online market, will help create new, legal ways of sharing quality video content, including free content with adverts," Roskomnadzor's spokesman told BBC News. "Moreover, film developers will finally start receiving satisfactory financial return on investment, which will have a positive effect on the amount and quality of films - something that is in the interest of millions of viewers." Copyright holders can go to Roskomnadzor and flag up websites that either host pirated content, or simply provide links to sites that do. Once the agency has notified the site's owner, the offending website has 72 hours to remove content and links - or risk having its entire domain blocked, pending a formal court ruling. But it's not just films and music that Russian internet users get for nothing. Electronic books are also a problem. 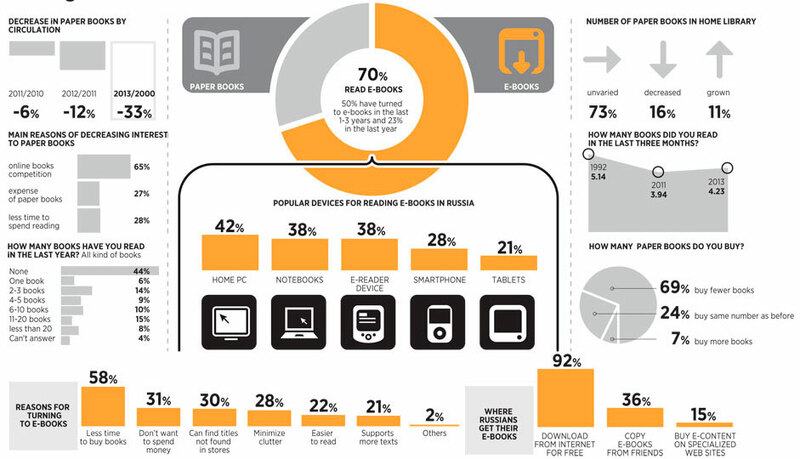 According to the Russian Association of Online Publishers, about 70% of all Russians who read books use ebooks. However, few pay. One recent study suggested that 92% of Russian ebook readers had downloaded titles from the net without paying, and 36% had copied files from their friends. If the new law works, the publishing industry is also expected to ask that books and music be covered as well. The move is unpopular with some and there are efforts to replicate US protesters' success at killing the Stop Online Piracy Act (Sopa) of 2012. "This law still needs more work," says Ms Malysheva. "It reserves the copyright for 70 years after the rights holder's death. "Five, 10 or 15 years would be understandable and we would support it, but not 70. "We think that this law is a political tool for controlling people. It is turning millions of Russians into potential criminals." Wikimedia Russia - the local manager of Wikipedia - has also raised concern the site could be blocked in the country if there are complaints about some of the links in its articles. Yandex, Russia's most popular search engine, says the measures are "directed not at fighting pirates, but at the internet itself - and it's almost like permanently closing down a highway where one accident occurred." An online petition has also clocked up more than 141,000 signatures calling for the law's repeal, while one local intellectual property lawyer has warned it could give rise to "commercial censorship" if big companies abuse the complaints process to shut down smaller competitors. Thousands of Russian websites have pledged to temporarily go offline as part of a nationwide "web strike", displaying the word "blackout" on their front page. Some web users have also replaced their avatars, the images they display on social networks, with a black square. But the Russian Association of Film and Television Producers argues that action was needed. "The adopted law will not answer all questions concerning copyright infringement, but it will, to a significant extent, protect copyright holders," it said.